Tuesday means another CSA delivery and another box full of fresh goodies! 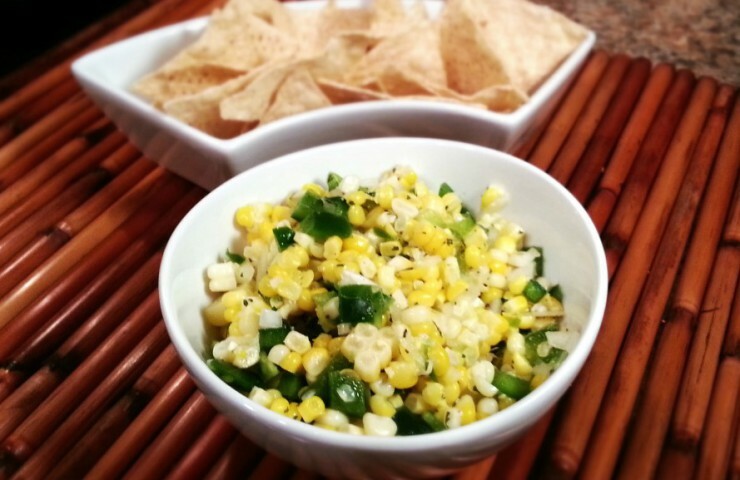 We’ve been receiving an abundance of Minnesota-grown sweet corn, and this week a corn salsa recipe was included in our box. I was already making enchiladas for dinner, so I figured I would make this up as a side to go with them. I modified the recipe slightly to better fit my tastes, and it turned out great. I will definitely be making this again! I recommend using fresh ears of corn, but frozen would work just fine too. Bring a pot of water to a rapid boil, then add 2 ears of corn. Cook for just 3 minutes; when the kernels turn bright yellow, it’s time to remove them from the water. Let cool, then use a knife to cut off the kernels from the cob and toss them into a medium-sized bowl. Finely dice 1/4 of an onion (you can add more if you like, I’m just not a huge raw onion fan), and 1/2 of a green pepper. Add both to the corn. Roughly chop a handful of fresh cilantro and combine with the other vegetables. Squeeze the juice of one lime into the bowl and drizzle in about 1 to 2 tablespoons of olive oil. Season with salt and pepper to taste. Place in the refrigerator and let all of the flavors marinate and combine for at least 30 minutes before serving. Enjoy with chips as a side or appetizer, or as a great compliment to fish tacos. A can of rinsed and drained black beans or fresh, diced tomatoes would be great additions to this salsa as well! Bring a bot of water to a rapid boil. Place ears of corn in the pot and cook for 3 minutes. When the kernels turn bright yellow, remove from the water and let cool. 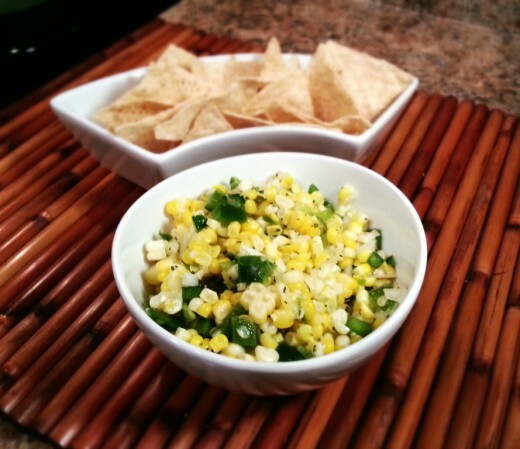 Use a knife to cut the kernels off of the cob and place in a medium sized bowl. Finely dice the onion and green pepper and add to the corn. Toss in a handful of chopped fresh cilantro. Squeeze the juice of one lime into the bowl and add 1 to 2 tablespoons of olive oil. Season with salt and pepper. Refrigerate and let the flavors combine for at least 30 minutes to an hour before serving. Enjoy with chips or fish tacos! Yields about 2 cups of salsa.